Velvet Paw Creations: Wonderland Tea Party Steampunk Top Hat for Blockheads Paper Arts! Wonderland Tea Party Steampunk Top Hat for Blockheads Paper Arts! 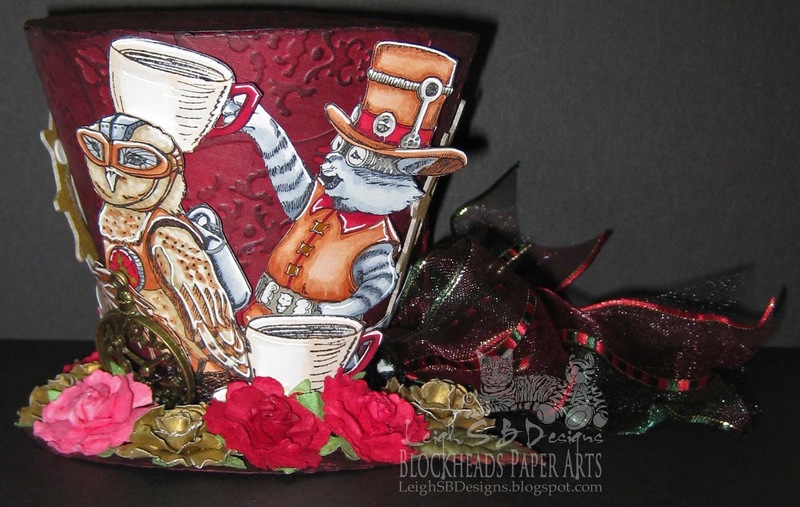 All the Steampunk animals are from Blockheads' Fringe Folktails stamp set. 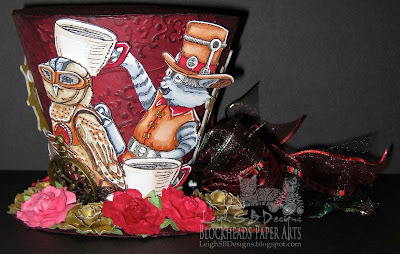 Stamped onto Neenah Solar White cardstock with Tuxedo Black Memento ink and coloured with Copic Sketch markers. For all the details on how I made the mini Top Hat please visit one of my other posts by clicking HERE! 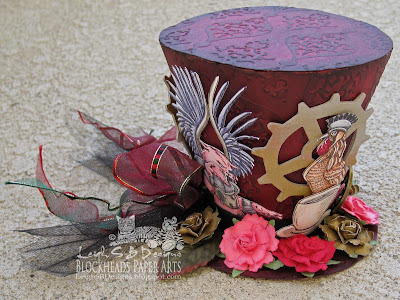 The gears and cogs are Tim Holtz Alterations Bigz and Movers and Shapers dies die cut out of Grungeboard and coloured with all 3 of the metallic Distress Stains. 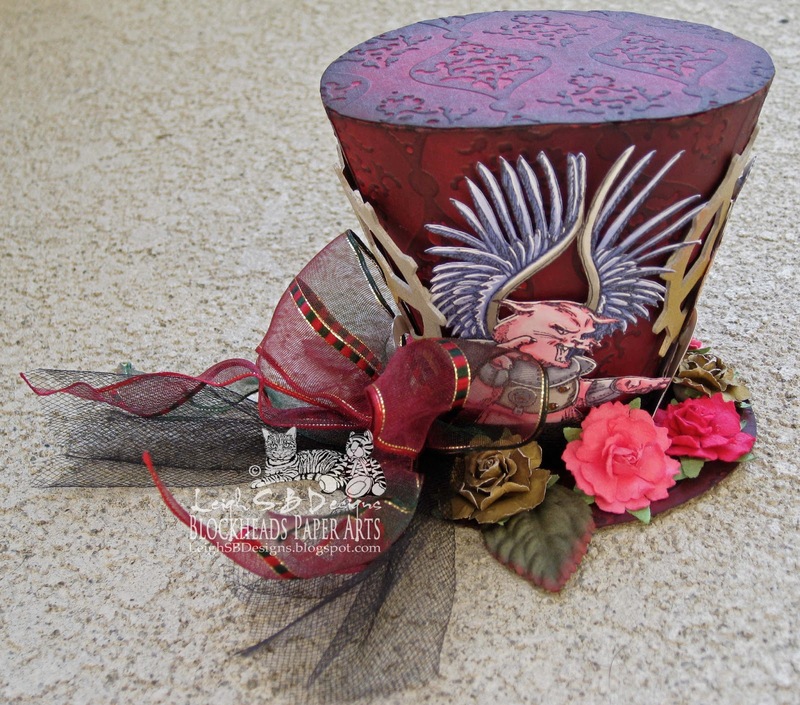 Everything was adhered to the Top Hat with Scotch Quick Dry adhesive and embellished with paper flowers, wired ribbon and black tule from Michaels plus an antique brass Steampunk pocket watch charm. Altered Alice Chapter 27 What a Wonderful Dream It Has Been! Leigh, so sorry to hear about your kitty. It's always a tough Imelda as they are "family" too. My bought a and prayers are with you. I hope you find peace soon. on your rss feed and I'm hoping you write again very soon! I am SO SORRY for your loss. I have two precious feline fur babies and I know what a hole losing one of them would leave in my life. 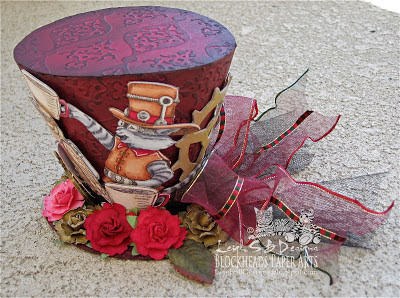 Fantastic top hat, wonderful use of these great images and your coloring and decorations are brilliant!